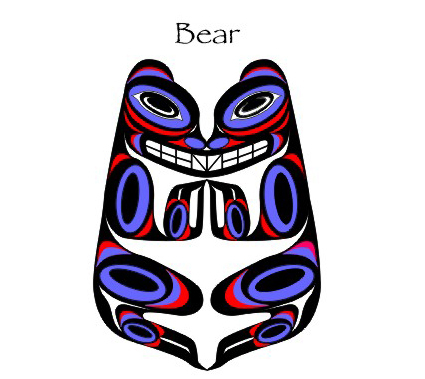 You can read “A First Course in Haisla” book by clicking here. 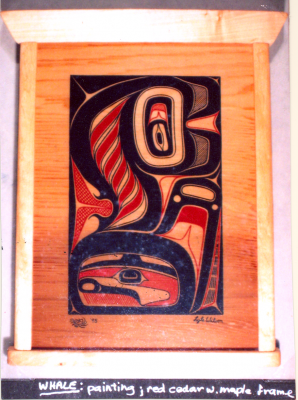 Art is a mainstay of the Haisla culture. 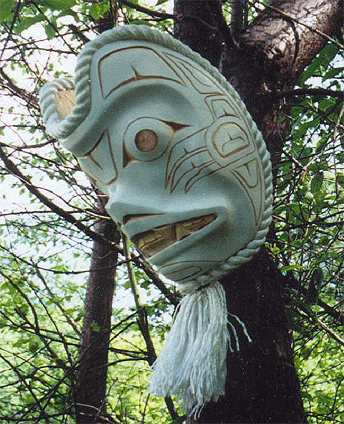 The Haisla Nation has produced a long lineage of talented and creative artists, who work to preserve traditional methods and craft new techniques. 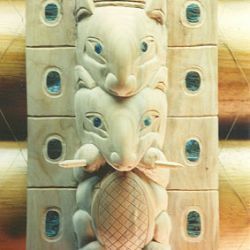 Haisla has a long-standing history of art and sculptural excellence, with skills often passed down generation to generation. 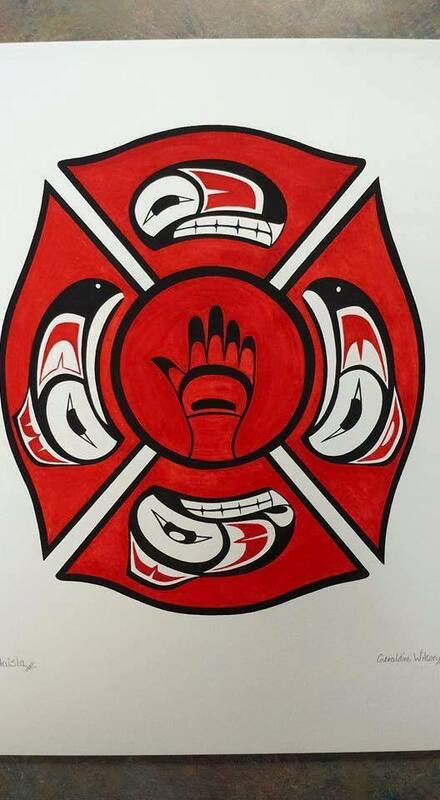 LYLE WILSON: KITAMAAT HAISLA ARTIST. 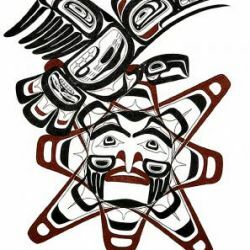 Lyle Wilson is a Haisla artist from British Columbia: born at C’idax (Butedale Cannery); spent his early years in Kitamaat Village; moved to the town-site of Kitimat from grade 4-9; then moved back to Kitamaat Village from grade 10-12; after graduating from Mount Elizabeth Secondary School, he worked at Alcan for a year before eventually moving to Vancouver to seek a post-secondary education at the University of British Columbia and the Emily Carr College of Art and Design. 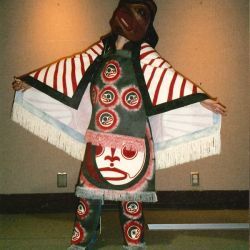 The Haisla people are often referred to as Northern Kwakuitl, however their historic artistic style is, mainly, influenced by the Kwakuitl, Tsimshian, Bella Bella and Bella Coola. The name Kitamaat means “People of the Snow“; which refers to the large snow-fall during the winters. 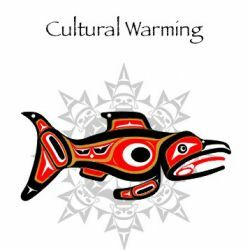 Tsimshian guests who visited the Haisla in mid-winter arrived to see people emerging from traditional bighouses that were completely buried by the snow. 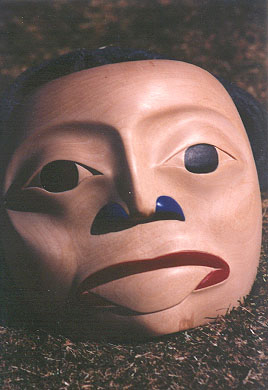 Thus, the name Kitamaat was given to the Haisla. 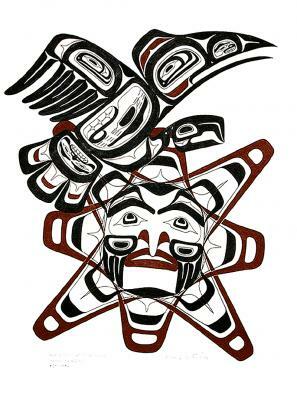 The Haisla Clan system was originally matrilineal and, although he was born into the Beaver Clan, Lyle was formally adapted into his father’s Eagle Clan. 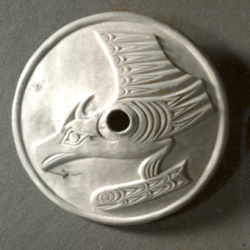 Due to high death rates at that time, his Eagle grandmother adapted both Lyle and his sister to bolster the numbers of the Eagle Clan (his sister has now returned to the Beaver Clan). 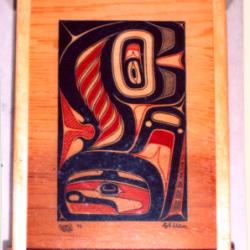 “I was always aware, and appreciative, of Haisla art after seeing a few old carvings at village places/events. My first living artistic influence was my uncle Sam Robinson — a full-time carver who carved at a time-period when everyone assumed Pacific Northwest Coast carving was a dying art-form consigned to the past; consequently, there was no wide-spread recognition of Northwest Coast art as there is now. I watched Sam and occasionally whittled to the best of my ability. I didn’t really seriously consider art as a profession until after attending the University of British Columbia — I enrolled, & completed, 5 years of the N.I.T.E.P. and Secondary Art Education programs. I found time in the studio more interesting and eventually left UBC for further studies at the Emily Carr College of Art and Design (now the Emily Carr University of Art & Design). 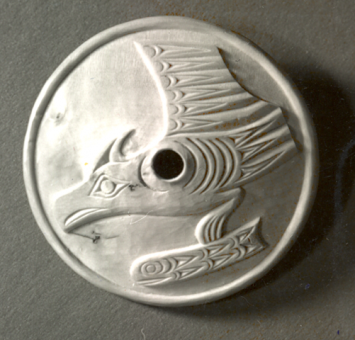 I graduated with a print-making diploma and began to try develop an individual artistic style — using my life experiences, formal education at UBC and ECUAD as the roots in all my art work: prints, wood carvings, paintings, drawings and gold/silver jewellery. I also prefer working by myself, because I believe that the individual personality shows itself in the finished work — so I’m reluctant to involve others in my artistic projects unless absolutely necessary. Even the extra large carving I try to do mostly myself so I can keep my personality in my work. 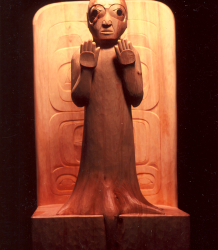 exhibition at the Coastal Peoples Fine Arts Gallery, Vancouver, B.C. 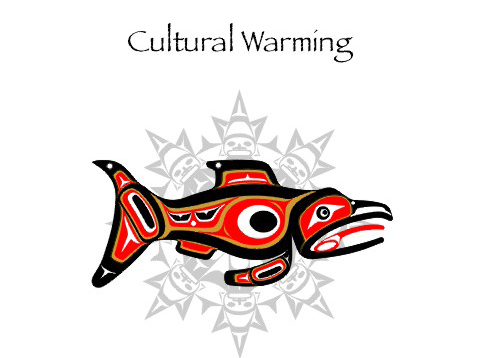 2016: Museum of Northern BC, Prince Rupert, B.C. 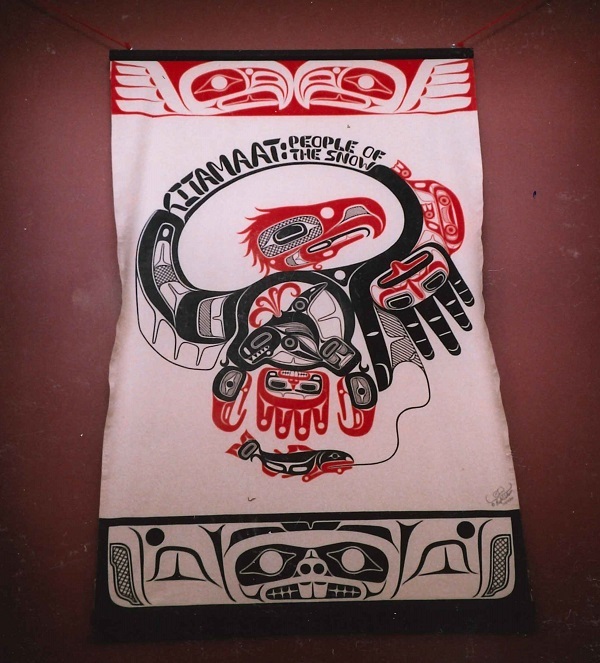 2014: Whatcom Museum’s Lightcatcher Gallery; Washington State, U.S.A.
2013: Kitimat Museum & Archives, Kitimat, B.C. 2013: Bill Reid Gallery, Vancouver, B.C. 2012: Maple Ridge Art Gallery, Maple Ridge, B.C. 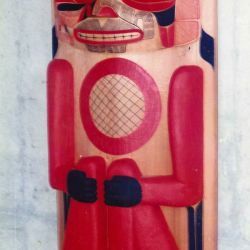 West Vancouver Museum, West Vancouver , B.C. 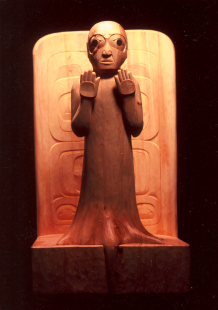 at the Coastal Peoples Gallery, Vancouver, B.C. exhibition at the Evergreen Cultural Centre Art Gallery, Coquitlam, B.C. 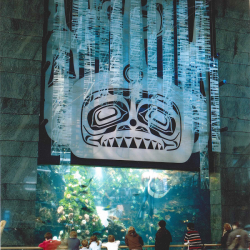 at the Vancouver International Airport, Van..
2) “DANCE FOR THE FIRST CATCH“. 3) “COASTAL SCENE“: 4 separate panels that make one whole scene. 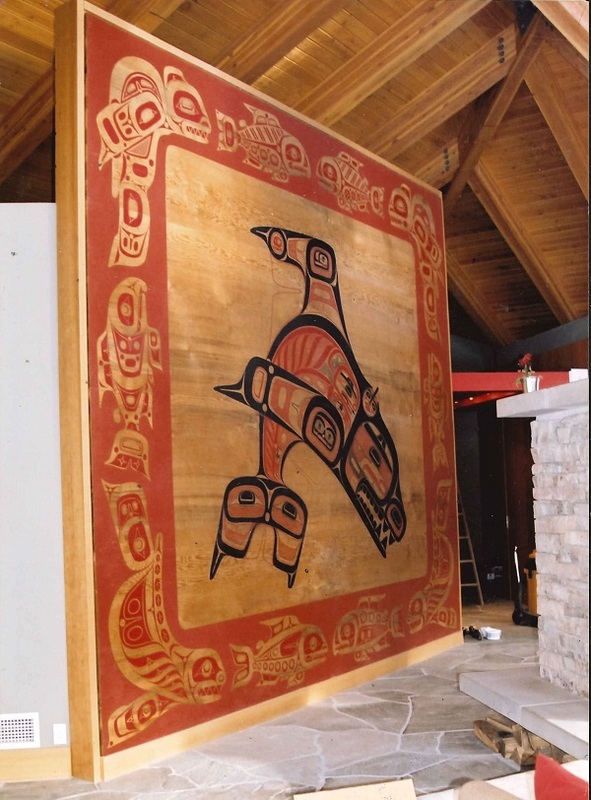 ~6 foot by 9 foot canvas screens at the Museum of Anthropology at UBC, Van..
~ 10 foot red cedar totem sculpture at the BC Sports Hall of Fame, Van..
1994: “EAGLE, FISH & BEAVER“. 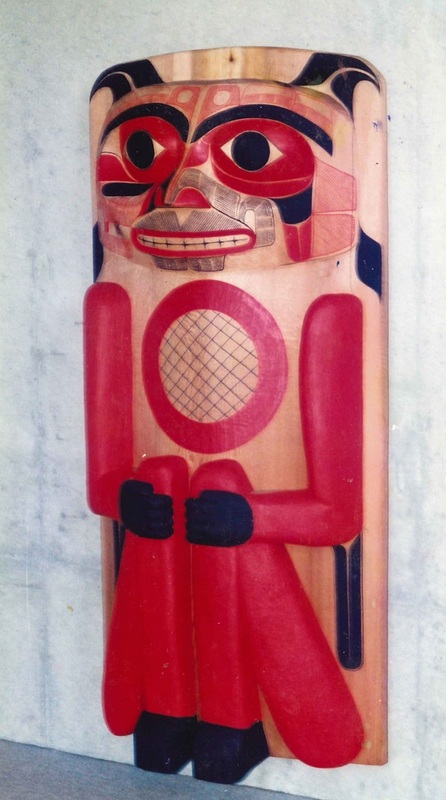 ~ 12 foot red cedar totem-sculpture, Canadian Consulate @ Osaka, Japan. 1993:1) “NOOMIS, THE BLIND MAN”. at Expo 1992, Seville, Spain. 1992: “EULACHON: A FISH TO CURE HUMANITY“. of historical work undertaken to this date . 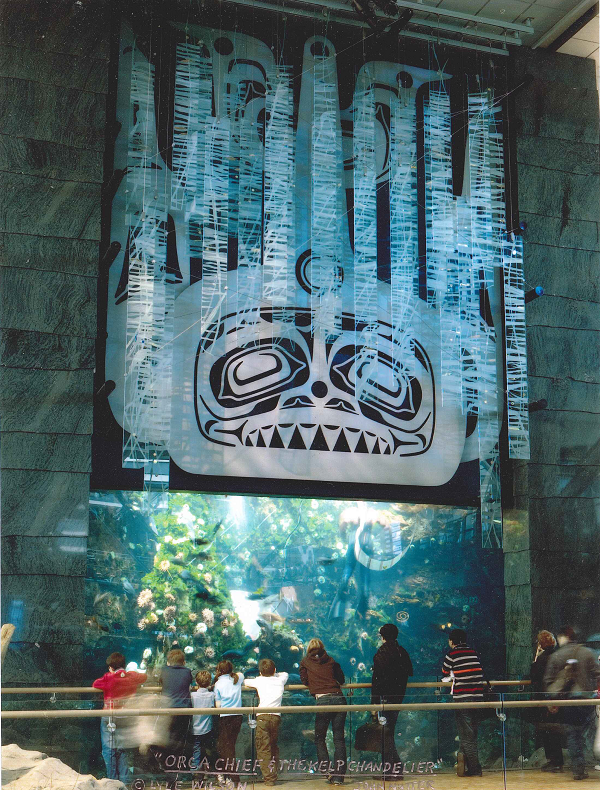 1987: “NORTHWEST COAST TRADITIONAL BIGHOUSE PROJECT “. bighouses were installed @ the Canadian Museum of Civilization, Quebec . University of British Columbia, Vancouver, B.C..
University of British Columbia, Van., B.C..
Aldona Jonaitis & Aaron Glass. 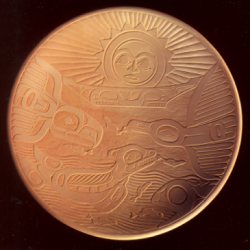 Kari Chalker, Lois S. Dubin, Peter M. Whitely; eds. .
~ Royal British Columbia Museum. 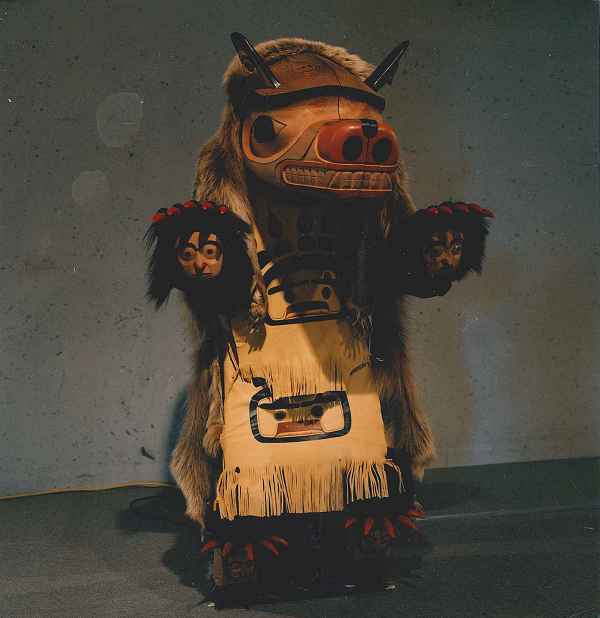 ~Museum of Anthropology at UBC. 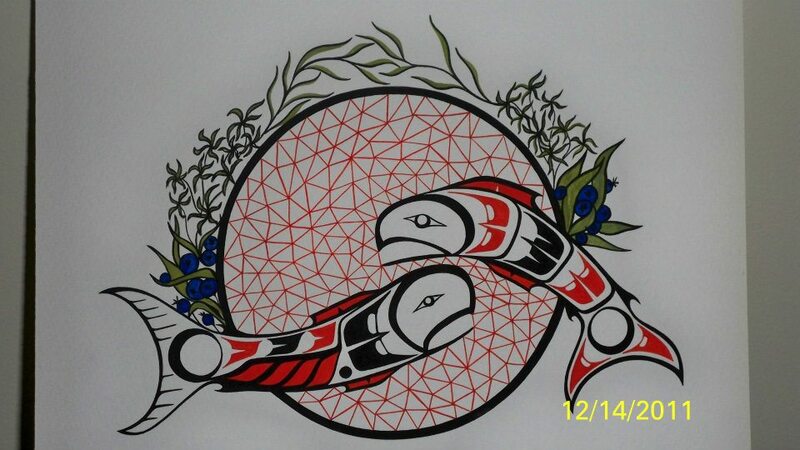 ~First Nations House of Learning. ~BC Sports Hall of Fame. ~Canadian Institute for the Blind. ~ Museum of Northern BC. 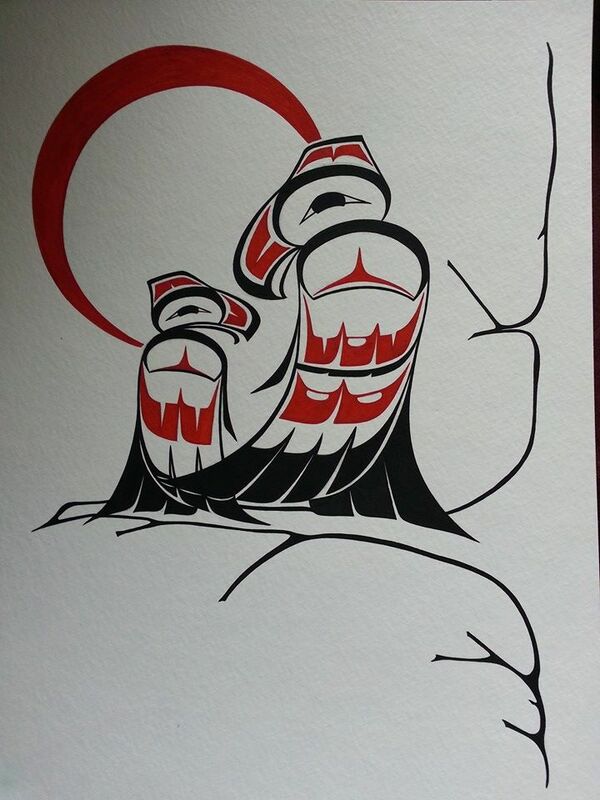 Burton Amos was born and raised in Kitimat on the Northwest Coast of BC, but is currently a resident of Vancouver, BC in Canada. 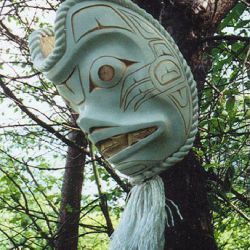 His traditional name is Ghe-yal-aghum which in Kwakwakawakw translates to “Face that comes from the begining” and is from the fish clan, which in Kitamaat Village, BC is under the Killerwhale (or Blackfish) Clan along with the near extinct Frog Clan. 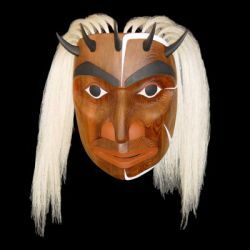 His prints, masks, regalia, and bentwood box designs can be found all across canada, in the U.K., and in Europe. 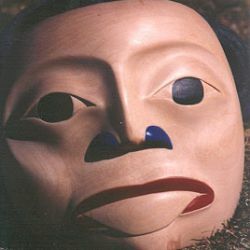 His book of poetry “The Return of the Elder Moon” will be released in 2011; He also works in the Film Industry from time to time on Documentaries and short independent films. 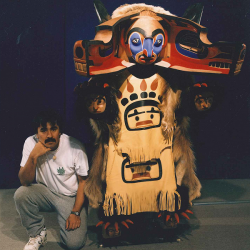 An artist and writer most of his life, he became serious about native art and design upon meeting Tsimshian/Cree artist Phil Gray, whom he apprenticed under in 2003/04. 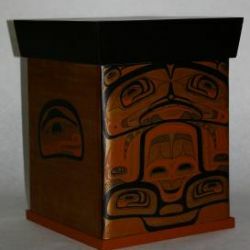 From there he went on to study the bentwood box style of design and is currently the newest apprentice to Master Carver Norman Tait, under whom Burton will study the art of carving rattles, totem poles, and jewellery. A life long dream come true for one whose family of artists include Victor Reece, Lyle Wilson, Sammy Robinson, Heber and Henry Reece, and Arthur Renwick. Burton plans to carry on the tradition of passing on his knowledge to his son and will continue to strive to give back to his community which his native heritage. 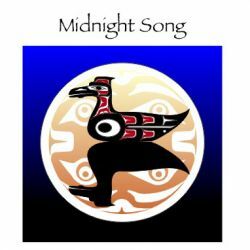 He also sings and drums with the Kwakwakawakw Urban Singers from North Vancouver and is currently learning his own Haisla Language. Sam Robinson’s art is world renowned. His designs have great power and beauty. 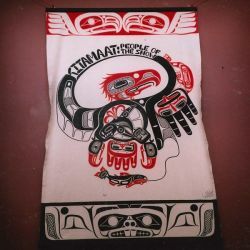 When you visit Kitimaat Village, be sure to drop in to Sam’s studio. The Art of Ab Morrison-Hayward is powerful and evocative. 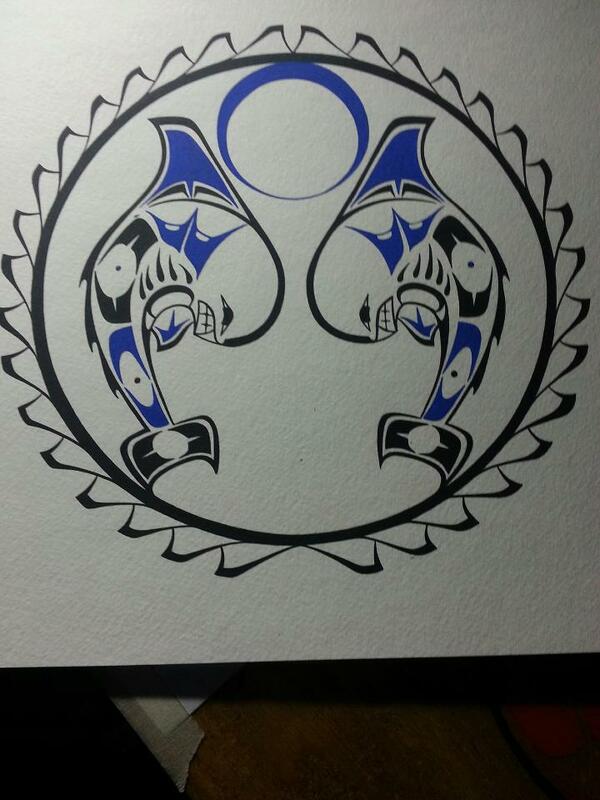 Ab’s work is representative of the traditional artistry which is enjoying a resurgence within the Haisla Community. 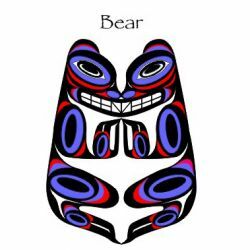 Born and raised in the Pacific Northwest, Brad Starr is from the Fish Clan of the Haisla Nation with ancestry in Kitamaat, Kemano, Kitasoo, and Heiltsuk. Major influences in his life have been the culture, lifestyle, and the values of his people. 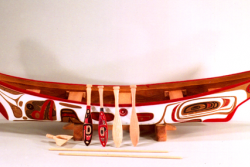 He has been inspired by two significant members of his extended family; His Uncle Sam Robinson – Master Carver of the Haisla Nation, and his Grandfather Solomon McKay – Master Canoe Builder of the Haisla Nation. 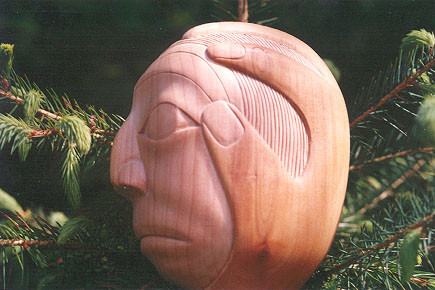 Carving is not a career or hobby for Brad, it is a dedication to the beauty and strength of his heritage. 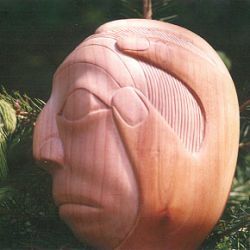 Through his carving, he hopes to create an awareness of and respect for the First Nations of the Pacific Northwest Coast. Brad worked in the construction field for many years. It was during this time that he gained anew respect and admiration for his ancestors. They were master builders and architects whose works were done without aid of modern materials and equipment. 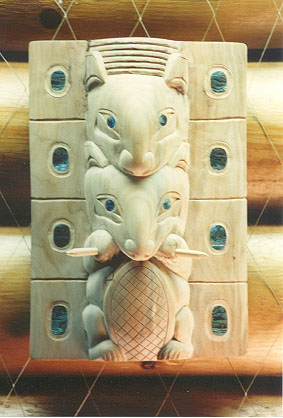 His first serious carving began in 1995. From the first time he picked up his tools and transformed a piece of wood from an idea into a physical reality, he has been captivated by this way of life. 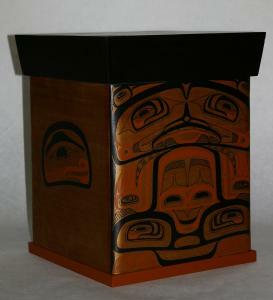 medium is wood; he also does printmaking and textile design. 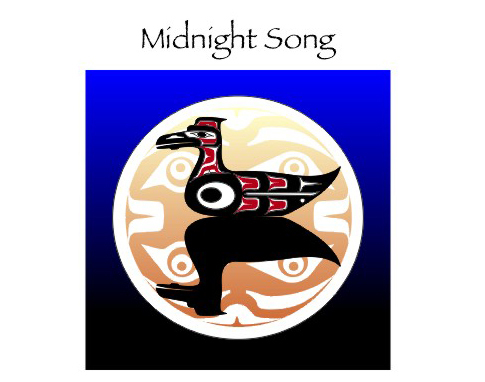 Geraldine Wilson was born and raised in the Haisla Nation. Her father and late mother, Bill and Bernice Wilson raised their five children here. Geraldine is part of the Killer Whale clan, her name is “Tae’s-Kyala’s”. Her love for traditional native art came from her late grandfather, Tom Nyce Sr., and uncle who carved and painted native artwork. 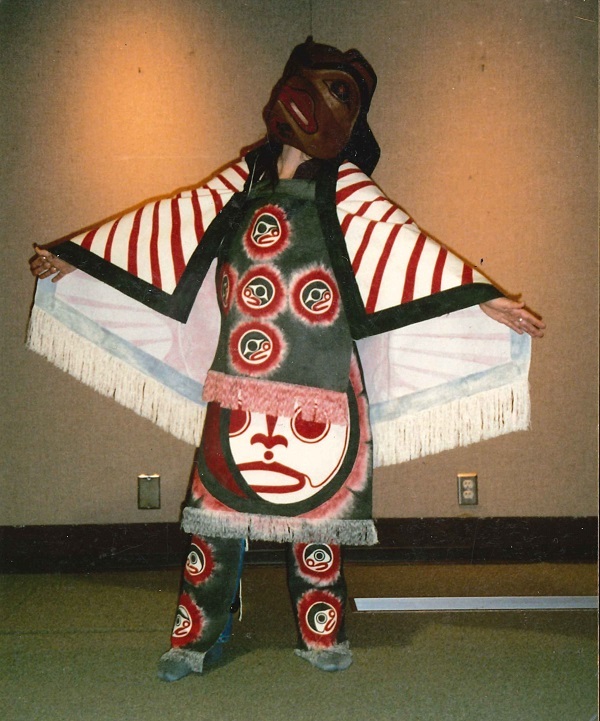 Geraldine attended Emily Carr College of Art & Design and obtained her certificate for “Art and Design” program in 1992. 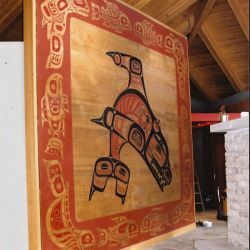 Her work includes the Haisla Nation clans (Blackfish/Salmon, Beaver, Eagle and Raven) and expands to cover customer requests; her art work has spanned from design on paper, wood and drums.